"But each spring...a gardening instinct, sure as the sap rising in the trees, stirs within us. We look about and decide to tame another little bit of ground." I mentioned my gardening heritage in the last entry, which focused on flowering plants. I also grew up tending vegetable gardens and have carried on that family tradition as an adult in several of the homes I've owned in Ohio, Georgia, Montana, and Virginia. None of my edible gardens have been as massive as the one we had on our Ohio farm when I was little, but I've done my own bit to save some money, provide fresh, safe food for my family, and have another excuse to indulge in my passion of "playing in the dirt." Home gardens are enjoying a resurgence in popularity this year for several reasons. The high cost of fuel has affected every aspect of our lives, including the food supply. The consumer ultimately has to bear the increased costs of growing, harvesting, transporting, processing, and packaging the foods we eat. In addition, several public health threats in recent months from food-borne illnesses like salmonella have folks on edge, worried about what they consume. It makes sense to take some at least a bit of control of the process by growing some of your own food, if possible. It's even touted as the "patriotic" thing to do. 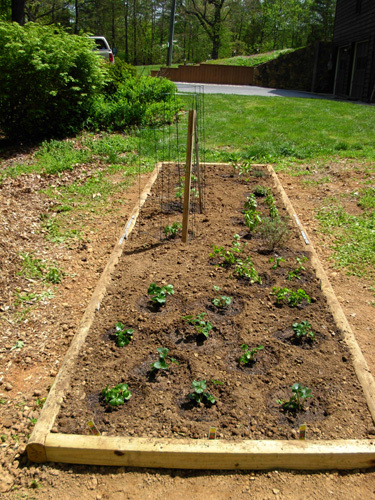 Planting gardens as a patriotic act may have begun with the "Victory Gardens" made popular during World War I and II. Home gardening lost some traction in the 1950s and 1960s as fewer people lived in rural areas and their lives became easier as more and more fresh imported produce and other goods became available in stores. A resurgence of home gardens occurred from 1973 to the early 1980s during the first major energy crisis and the "Mother Earth" movement. Now here we are again with some of the same national and global issues affecting us locally and influencing many folks to plant their own gardens this year. Jim and I grew vegetables in our garden in Billings, Montana the four summers I lived there in the early 2000s but this is only the second one we've had since we moved to Virginia. If we hadn't been gallivanting around the country so much, we'd have had one each summer. This is a great climate for gardening! Not only did Jim and I "inherit" lots of flowerbeds from the former owners of our current home, we were also faced with a daunting, freshly-plowed vegetable garden in our back yard that measured about 45 x 60 feet -- smaller than the veggie garden of my childhood, but 'way bigger than any I've tended on my own. No wonder these 70-something folks admitted they could no longer keep the place up and needed to sell it! That should have sounded a louder alarm for us. but we were a "young" 55 at the time and figured we could maintain the property for at least fifteen years . . .
Not realizing just how much we'd be traveling around the country, our original plans called for planting much of that space with fruit trees, berry bushes, and some vegetables that we could can and freeze. 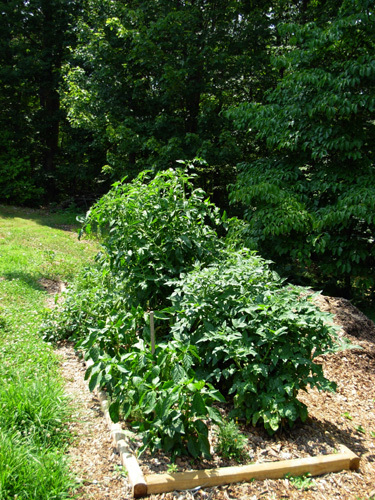 I planted several kinds of herbs, tomatoes, and peppers that first summer. The next photo was taken on June 14, 2004, a month after we moved into the house. I planted half a dozen herbs on another corner of the original garden area (also covered in weeds) that was closer to the house. Bob, the neighbor who mows our yard when we're gone, and his wife ended up reaping most of the harvest because Jim and I were gone for several weeks on two cross-country trips to run races in California and Colorado. What Bob didn't get was enjoyed by the deer, squirrels, rabbits, birds, and other wildlife who share our property. We got *real* after that. 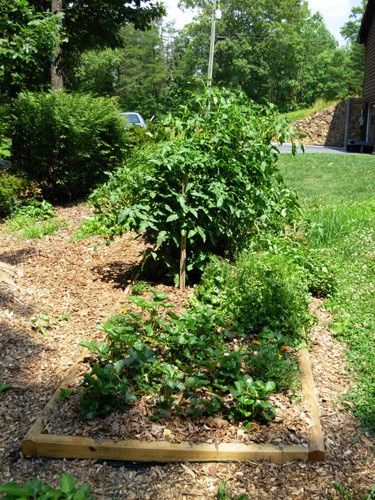 Not only do the flowerbeds not take care of themselves when we're gone, neither do fruits and vegetables. Duh. So there were no fruits and vegetables planted in 2005, 2006, and 2007 when we knew we'd be gone all summer. 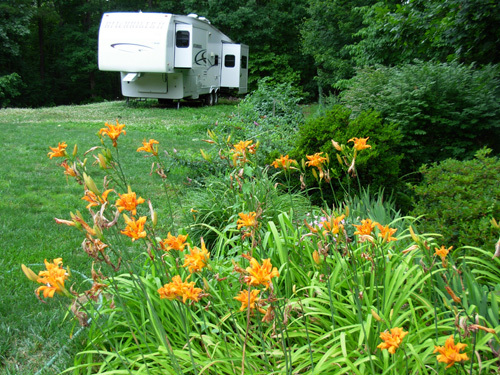 The "vegetable garden" became an extension of the yard and soon morphed into the parking area for our camper (below, as seen in early July, 2008). Fast-forward to May, 2008. Jim and I finally decided not to travel out West for the summer because of the high cost of fuel. (We're still ambivalent about that decision!) I started looking forward to all the beautiful flowers we have. It was Jim who said, "Let's plant some tomatoes!" Jim loves tomatoes. Eating them, that is. I knew from experience that "Let's plant tomatoes!" really means "Let's you - SUE - plant tomatoes and I'll eat them!" Fair enough. I enjoy eating AND growing them. Jim's grown his fair share of tomatoes during his lifetime. I'll gladly tend the gardens and he can mow the grass. That's a good trade-off in my book. IF IT'S WORTH DOING AT ALL . . .
to doing something better than they have ever done before." Ha! Now if you either know me, or have been reading much of this journal the past four years, you know that many of my little projects turn into major projects. It's hard for me to do anything that truly interests me in a small or half-hearted manner. Just look at my training schedule, the races and journey runs I tackle, the elaborate multi-volume Appalachian Trail scrapbooks I'm creating, and other projects I've done over the years. "If it's worth doing, it's worth not only doing well, but over-doing" seems to be my modus operandi. Even though Jim's also an *ultra* runner, he's not as bad at upsizing other projects as I am. You can probably guess where I'm going with this re: this summer's veggie garden . . .
Actually, I didn't over-plan how much I'd plant. We haven't ended up totally inundated with produce we can't eat or preserve. This time my "problem" was under-estimating how much space we needed for the plants I put in. I mentioned previously that we built and planted a 4x16-foot raised veggie garden this spring. That seemed quite manageable. I put in four tomato plants, three pepper plants, ten ever-bearing strawberry plants, five different kinds of herbs (total of eleven plants), and half a dozen marigolds as "companion plants" to keep bad bugs away from the veggies. I'll show a sequence of what the bed looked like from May to August. June 26: Everything is bushing out. This is what I envisioned the "mature" garden would look like. NOT. Who knew how well those plants would thrive -- 'way beyond our expectations -- with lots of top soil, compost, fertilizer, water, and sunshine?? Oh, my! They've been totally out of control for several weeks. 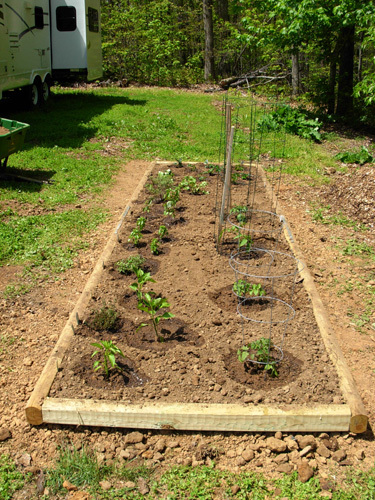 We should have made the bed at least twice as big, spaced the plants farther apart, and used much taller, sturdier supports for the tomatoes. Even the peppers are sprawling and should have been caged. First the four little cilantro plants grew too fast and I eventually just dug them up when they had more frizzy tops than edible leaves. Then the tomatoes grew faster than I could tie them up and nearly killed the oregano and thyme in front of them. Transplanting killed the large oregano; I'm still looking for a replacement plant at nurseries and the Roanoke Farmer's Market. The thyme likes its new location but is again in shade as the adjacent tomato has sprawled even farther. The rosemary became a bush and two kinds of basil (four plants) are flourishing despite the overhanging tomato branches. The basil and peppers simply spilled over the wooden side of the bed by one to two feet in their search for sunshine. They adapted! 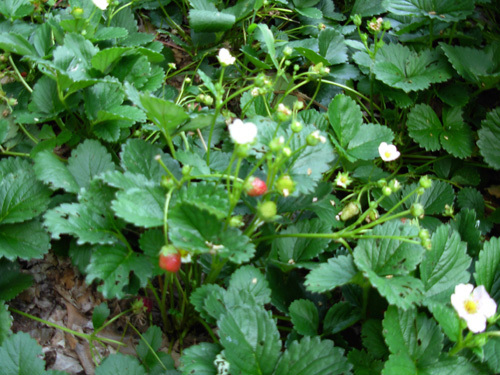 The strawberries have also done well even though I broke the rule about plucking the blossoms this season and waiting until next summer to let the plants bear fruit. I love strawberries and just couldn't wait. Besides, I know how many berries they can have in the first season. Over the years I've more often let strawberries produce fruit the first year than not, due to my impatience. There are worse sins, after all. Jim and I have been able to keep up with the berries as they ripen, partly because we're sharing some with birds and maybe rabbits -- not exactly by choice, mind you. I like to let the berries ripen on the stems but some get sampled before I pick them. I either leave nibbled ones on the plants or give them to Cody. He's like "Mikey" of Life cereal fame -- he'll eat almost anything! That's why his nickname is "Hoover." tomatoes (left background) and peppers (right background). The pimiento (Fajita Bell) and red bell peppers have been producing well for about a month. We can keep up with them OK, too. Tomatoes are another thing entirely, as any experienced gardener can tell you. They're as prolific as zucchini squash -- there are always extras to give to neighbors! We started picking ripe cherry tomatoes in early July. 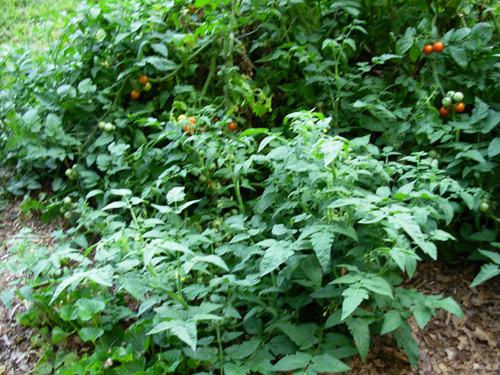 The cherry tomatoes (Husky Cherry Red) are very tasty and have produced heavily for several weeks. We eat them like candy for snacks and with meals. 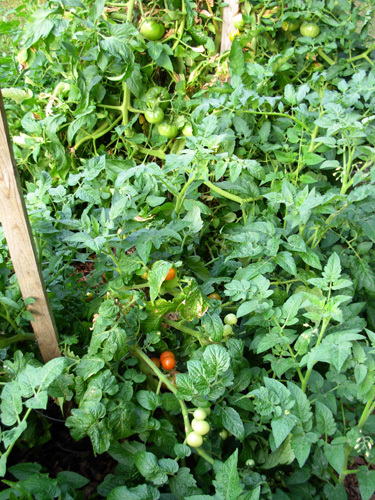 The plants got MUCH larger than any cherry tomatoes I've ever grown before, so they soon escaped their cages, too. We're able to keep up with the little tomatoes better than the large ones (Big Boy and Better Bush) that have been ripening at the pace of five to ten a day since early August. I'm just not in the mood to can them this year. It's a hot, time-consuming, messy job. We've got all the equipment but we don't want to heat up the kitchen to process them. We're sharing them with friends in town and neighbors who don't have their own supply. 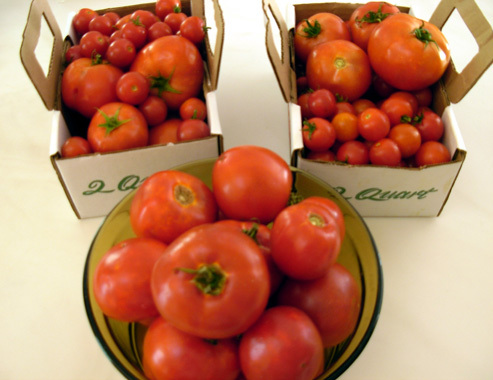 Since we're out in the country it's hard to find folks who do NOT have their own tomatoes. Neighbor Bob planted tomatoes but the rabbits have been stealing his, so he's been happy to take some off our hands. 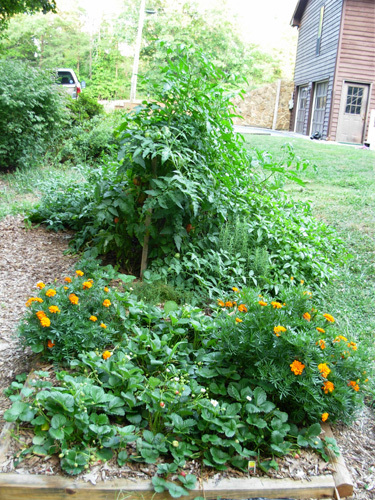 We've been enjoying lots of salads, BLT sandwiches, kabobs, and other dishes with our tasty herbs, peppers, and tomatoes. I don't know that we've saved much money but just having ripe-from-the-garden produce makes the whole process worth it to me. 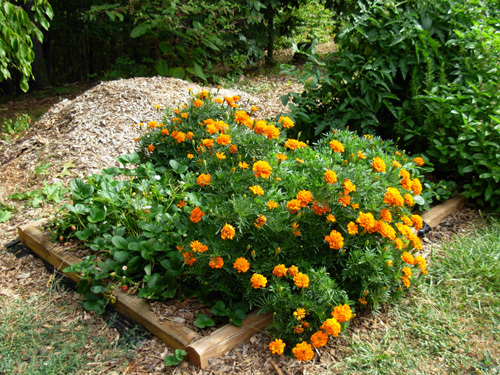 The garden will become more cost-effective in future years (if we're here to plant it). The main expenses this year were for the lumber, soil, and compost. Starter plants are pretty cheap and I used only a little bit of generic commercial fertilizer. Our well water is essentially free. All of our seedlings came from Lowe's this year and they have done well. 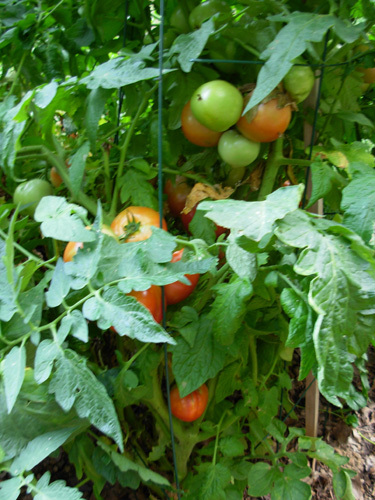 We haven't had any bug problems, diseases, blossom-end rot, or soil deficiencies. Other than the unsightly sprawl, I consider the garden a success. 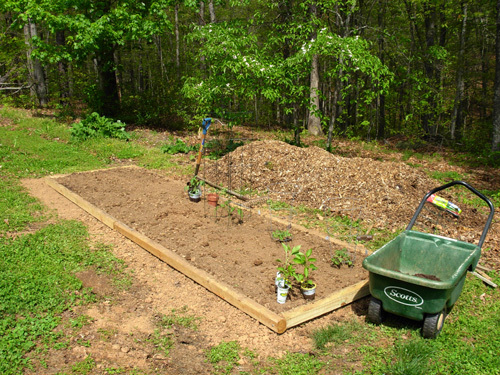 If I get real ambitious, I might dig up a spot nearby to plant some spinach, sugar snap peas, and other cool-weather plants that we can harvest in September and October. We'd also like to plant some wine berry bushes so we'll have our very own supply. That's another quote that can translate just as well to running. I can identify with this! Many gardeners dream of having a bigger and/or better garden the next time, just like runners dream about having a better race the next time -- whether they met their goal in the last race or not. If they did well, they realize that maybe with better training they can do even better next time. If they didn't meet their goal, they have even more incentive to regroup and do better next time ("unfinished business," Jim and I call it). Some folks are just wired to try to make improvements. By now, the marigolds are trying to take over the strawberry bed! That's just one marigold plant on steroids to the right. I've never fertilized it. 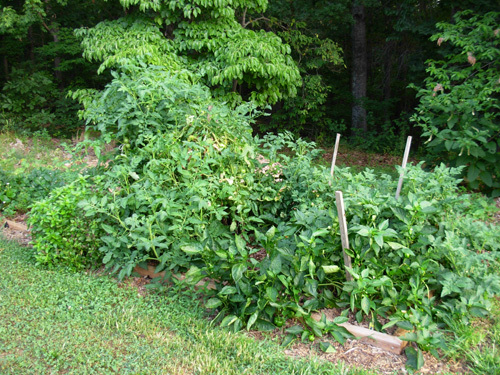 Will we have a bigger, better vegetable garden next summer? Maybe. We currently plan to be gone most of July and August in 2009. 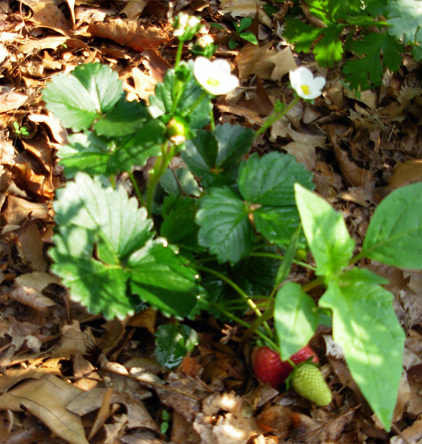 The strawberries are perennials, so they'll remain where they. I might let them take over most or all of this 4x16-foot bed. We'll enjoy some strawberries before we leave for Colorado and Bob can have what ripens while we're gone. I'll probably plant more cool-season crops and perennial herbs in the spring so we can enjoy them before we go. If it's another dry summer the herbs might not make it till we get back home; we turn off the water when we leave so it's not practical to ask Bob to water anything. I might just dig up the herbs and take them with us as I've done on previous camping trips. I love to cook with them. 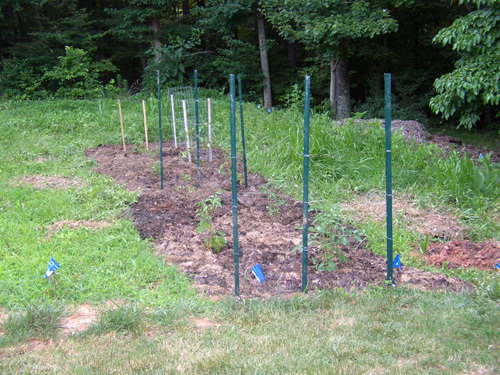 If we end up at home most of next summer, I'll probably plant tomatoes and peppers again -- but I'll make another bed for them, space them much farther apart, and provide adequate support. I've learned my lesson! And maybe I'll plant some squash, too . . .
BTW, all this goes to show you don't have to devote much real estate to a garden to reap copious amounts of vegetables. 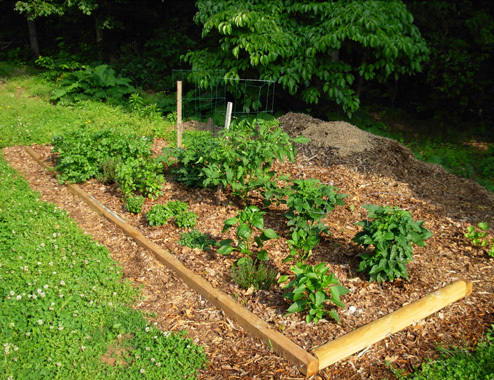 And if you use the "square foot" method of gardening, you can get even more in less space. ADDENDUM AUGUST 28: WE'VE GOT RAIN!!! You know how I've been whining in the last two entries about the drought? I should have heeded the saying, "Be careful what you wish for." Or, as Jim says much more succinctly, "I hope you're happy now!" I'm not the only one concerned about our drought. Plenty of folks in southwestern Virginia have been wishing mighty hard for a good soaking rain. We've finally gotten one, in spades. For some people, it's good news. For others, it's bad news. The Roanoke Valley and where we live near Smith Mountain Lake east of the city has been eight to twelve inches below normal rainfall this year. Most of the deficit has occurred this summer. Only one town has had water restrictions so far because its river was historically low, but both Carvin's Cove and Smith Mountain Lake, which supply much of the region with water, have been getting lower and lower. I was getting tired of watering our gardens so much (from our own well water) and concerned about the health of all the trees I couldn't water. Lots of leaves have been dropping already from the stress, and weaker trees don't fare well in wind storms. Now I have a feeling of deja vu. Our first summer here in 2004 we had two six-inch rainfalls, one in August and one in September, that caused major flooding in Roanoke and other parts of the valley. They were remnants of two hurricanes that wrought devastation in Florida. 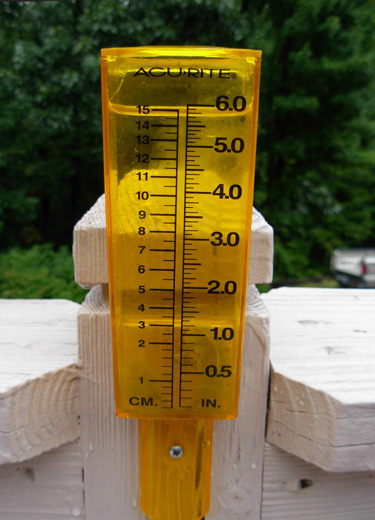 We just received a good soaking rain, six inches of it so far (per our own rain gauge, above) over the last 48 hours. There is more predicted this week. Most of it has been light to moderate at our place, but some areas are flooding and that situation may worsen in the next few days as more water flows downstream from the Blue Ridge Mountains. These are remnants of last week's Hurricane Fay, which didn't have as much damaging wind as a lot of hurricanes but dumped up to 30" of rain in some areas of Florida. Fay set a precedent by making landfall in Florida a total of four times -- it just wouldn't go away! It took several days for the storm to dump more rain on Georgia and the Carolinas before finally reaching us. Locals have apparently forgotten how to drive in the rain. (Just wait for the first sleet or snow!) Jim's 911 radios have been busy summoning rescue squads and fire departments all over Bedford County. It's the same scenario throughout the valley. Jim's been out on calls to a couple of the wrecks. Some roads are flooded, and the creeks and rivers continue to rise. But there are positives, too. 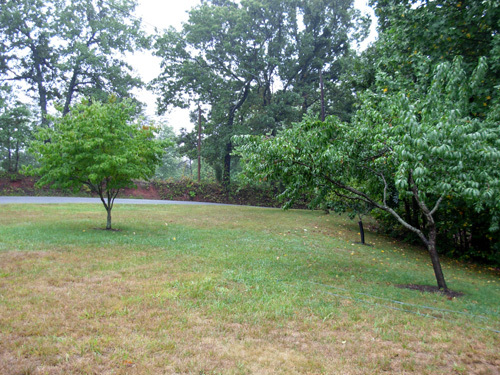 On the third day of rain and drizzle we can see our front yard getting more green (photo above). I mentioned that it was crunchy brown in the last entry. The rain should help some farmers with their crops, if it isn't too late. When the sun comes back out tomorrow, we'll be able to see new growth and less leaf wilt along the trails when we do our long runs. Water supplies and aquifers should be in better shape and we'll worry less about our well running dry. Hopefully, this will be a drought-breaker and not just a break in the drought.